A large OEM engine builder was seeking a solution to their difficult installation process. Because of large engine components and remote installation locations, these technicians were often required to use less-than-ideal techniques to repair and install new components on damaged or out-of-service power generation units to get them back in service. The gasket in question had a rubber grommet to aid in sealing a coolant port that traveled through an exhaust gasket. The very large and heavy engine components required field technicians to hammer the gasket in place between the cylinder head and exhaust manifolds. This installation method often damaged the poorly designed gasket and shaved off or knocked out the critical rubber grommet. CGR’s Product Development team designed a multi-layer gasket with advanced manufacturing techniques. The part utilized edges that were folded over to fully encapsulate the gasket media, holding and protecting the critical sealing grommet in place during installation. Due to the robust design and advanced manufacturing techniques used by CGR, this gasket design has become the industry standard for this type of engine application. The gasket now has an expected lifespan of 40,000 + hours. 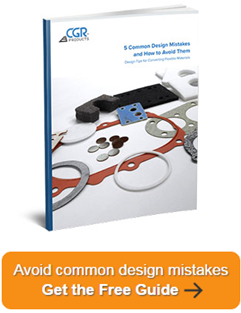 CGR has duplicated many of the techniques and tool designs from this gasket into other applications to advance our gasket designs. View more of these gaskets in our Sample Gallery. Watch Chris Ispa deliver a live presentation of this project’s details at our Open House.